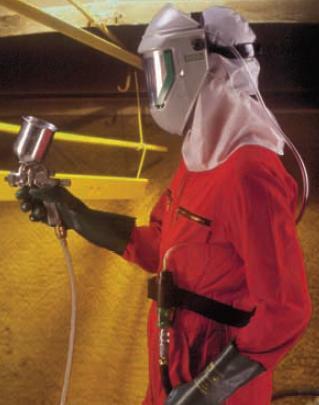 A classic paint spray hood. The elastic face seal is very comfortable. Disposable visor covers are easily removed when soiled, protecting the main visor from getting soiled. Ratched type head gear. 3050-750 - Light hood "Cavair al" consisting of: main visor with lens and head harness, replaceable cover lens and disposable hood, compressed air line, waist belt with control valve and coupling to air supply.